Our 60mm Viper Rear Step Bars add style to your 4x4 with a purpose. Beautifully formed in Hand Polished Stainless steel with a fully integrated black polymer step, which provides both vehicle access and Crash Protection for those minor bumps and scrapes in the car parks! Our AK030 Viper Rear step bars are specially engineered to suit your Chevrolet Captiva 2006 to 2011 SUV. The rear bar is profiled to sit above the exhaust pipes as shown in the picture below. The step also includes a laser cut stainless steel detail with the word 'Captiva'. Our 4x4 Rear Bars and Side Bars are Hand Polished to a chrome look mirror finish. The quality of fitting is just Excellent! We use only the Best European Quality Polished Stainless Steel Tube from Italian Steel Mills. Our Tube has a massive 1.5mm wall thickness for great quality Rear Bars. . The price includes a Chunky tubular Viper Rear Step Bar for Captiva which fixes to original mounting points and is supplied complete with all the brackets ready for installation. These are a NON DRILL rear protection product, easy DIY fit! Stunning value for your Chevrolet Captiva 4x4 SUV giving an excellent finishing touch. *** Note: Will not fit 2011 on models. 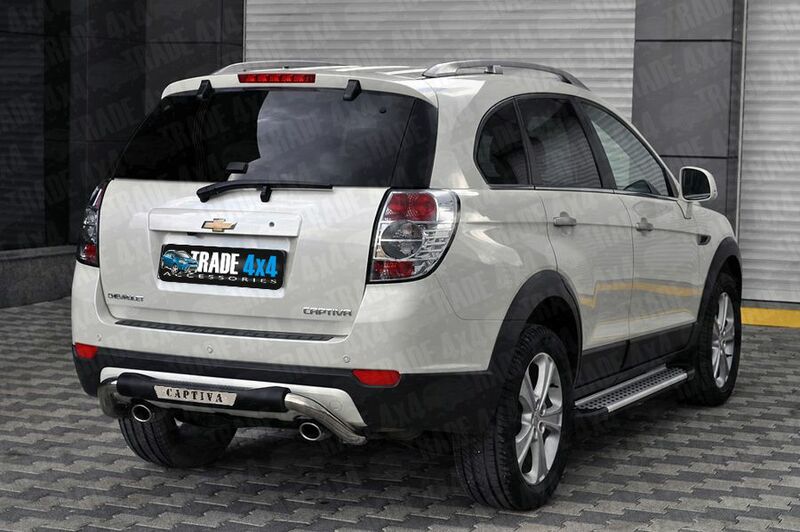 Click the button below to add the Chevrolet Captiva Viper Rear Step Bar AK030 Profiled Rear Protection to your wish list.